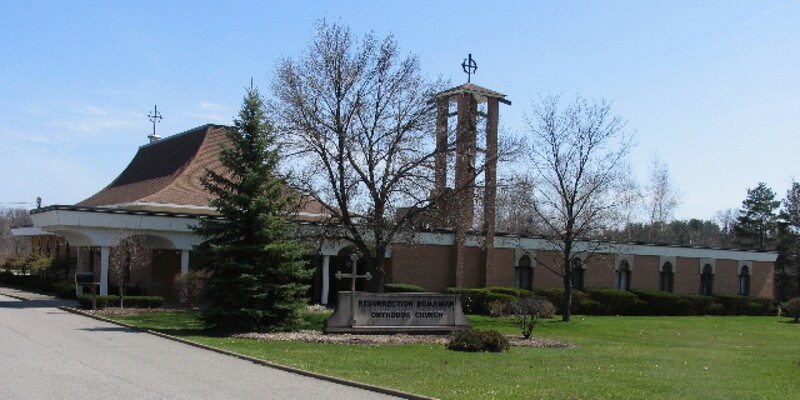 Welcome to Holy Resurrection Orthodox Church (HROC) located in Warren, Ohio. We are part of the Romanian Orthodox Episcopate of America. The Orthodox Church is the original Christian Church, with an unbroken line of Christianity from the Day of Pentecost to the present time. 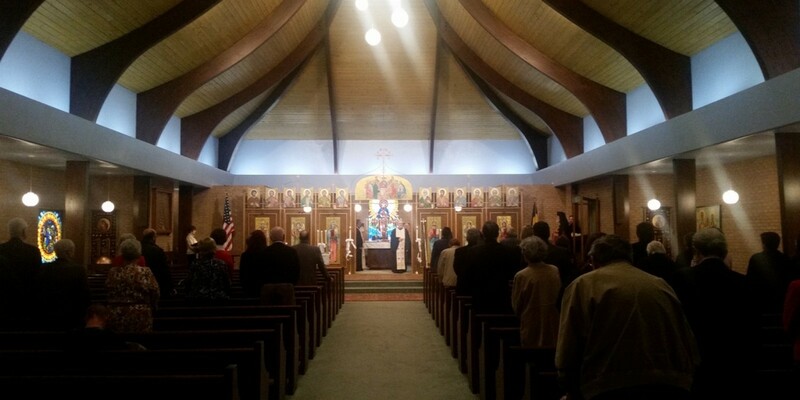 The Orthodox Church has been called "the best kept secret in America." Even for Christians familiar with one of the Western liturgical traditions, some of our practices may seem foreign. And for Christians and others who are utterly unfamiliar with liturgies, some of our practices may seem unnecessary. We have anticipated some of your likely questions below. With the answers provided, you will discover that the Orthodox Liturgy engages all the senses and addresses the spiritual needs of the whole person: "O taste and see that the Lord is good" ( Psalm 34:8). Why is the service called "The Divine Liturgy?" Who is St. John Chrysostom? "Liturgy" comes from a Greek word that means "a common effort" and "divine" relates to the worship of God. So the Divine Liturgy is the common effort of Orthodox Christians to worship God. It is the primary public form of Orthodox Christian worship, wherein we celebrate the Eucharist -- Holy Communion with God in Christ. The version of the Divine Liturgy celebrated on most Sundays is that of St. John Chrysostom, the 5th century Archbishop of Constantinople, capital of the Eastern Roman Empire. We also use the slightly longer Liturgy of St. Basil the Great, the 4th century Archbishop of Caesarea, on 10 occasions each year. Is childcare available during the service? Is there a children's church service? Children's church school is held at the conclusion of Liturgy. We do not offer childcare or hold a separate children's service because children benefit no less than adults from participating in worship and by receiving Communion (see Matthew 19:14, Mark 10:14, and Luke 18:16). Infants baptized in the Orthodox Church are considered fully part of the Church. Moreover, we encourage families to worship the Lord together. We anticipate a certain level of distraction and noise from very young children, the sound of a healthy and growing community. In fact, one American Orthodox theologian, Fr. Alexander Schmemann, referred to the activity of children during Liturgy as "holy noise." Of course, very disruptive children should be taken outside until they become cooperative again. Nevertheless, Orthodox practice is for the whole community to worship together. Why are bells rung during the service? The ringing of bells serves as a call to worship and an announcement of certain parts of the Liturgy. Bells are run at the beginning of Liturgy, during the recitation of the Nicene Creed, during the Lord's Prayer, and at the end of Liturgy. Why is the building decorated with so many portraits and other paintings? Are they idols? Why do you kiss them?Those paintings are "icons", a Greek word for "images." Icons are stylized representations of Christ, the Virgin Mary, other Saints, and scenes from the Bible and Church history. Ages ago, when few people were literate, icons were non-verbal teaching tools. Icons use very specific language that can be read. We even say that icons are written rather than painted. Icons are not idols. Even in the Old Testament, in which God condemned idolatry of images (Exodus 20:4-5), God ordered angelic images to decorate the Tabernacle and Temple (see Exodus 25-26 and 1 Kings 6). Icons convey deep spiritual truths rather than realisic objects of worship. Orthodox Christians use icons -- sometimes called "windows to heaven" -- as aids to prayer. We kiss icons to show respect to the person or people represented "in spirit and truth" (John 4:24). Why are Orthodox Christians continually touching their heads, chests, and shoulders? This is the Sign of the Cross that we make to show our belief in Christ's sacrifice on the cross as well as our commitment to "love God with all your heart, soul, mind, and strength" ( Deuteronomy 6:5, Matthew 22:37, Mark 12:30, and Luke 10:27). The Sign of the Cross is made with the right hand -- the thumb and first two fingers joined to symbolize the divine and human natures of Christ -- touched to the head, chest, right and then left shoulders. Most often we make the Sign of the Cross when we prayerfully mention the name of Lord -- Father, Son, and Holy Spirit -- or when the priest turns to bless the people. Sometimes we add to the Sign of the Cross a deep bow from the waist, touching our hand to the floor. This is called a "reverence." On certain occasions during the Church calendar, we add to the Sign of the Cross a "prostration," in which we kneel and touch our foreheads to the floor. All of these gestures -- the Sign of the Cross, the reverence, the prostration, and the kissing of icons and other sacred objects -- should be understood in light of James 2: faith and actions working together. These are not superstitious gestures, but prayer from the whole person -- mind, soul, and body. Why is there a wall at the front of the church? This wall, the "iconostasis", a Greek word that means "icon stand," is an important feature of Orthodox Church architecture. It separates the sanctuary (where the clergy lead prayer before the altar) from the nave (where the people stand and respond in prayer)*. 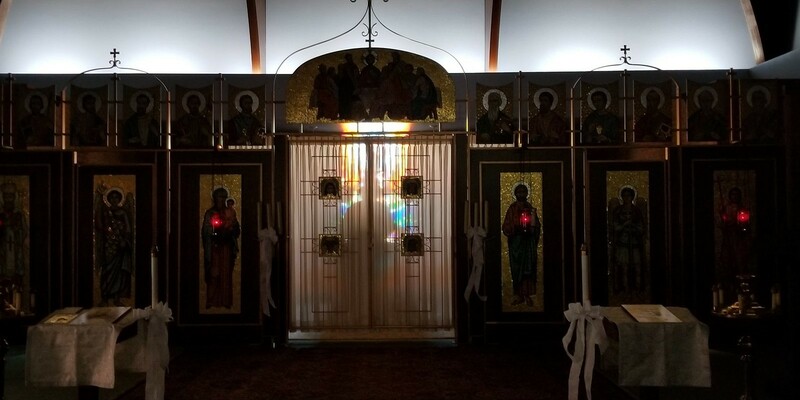 In any Orthodox church, the iconostasis may have two or three tiers of icons, but the main tier of icons follows a customary pattern from left to right. At our church you will see the icon depicting the Old Testament manifestation of the Most Holy Trinity, to whom our church is dedicated, the north door with the icon of St. Michael the Archangel, the icon of the Virgin Mary, the Great Doors with icons of the Annunciation and the Four Evangelists (Ss. Matthew, Mark, Luke, and John), the icon of Christ, the south door with the icon of St. Gabriel the Archangel, and, finally, the icon of the Theophany of Our Lord, depicting Christ's baptism by John the Baptist. Why are so many candles burning in front of the iconostasis? Candles are used in all Orthodox services. They symbolize Christ as "the Light of the World" (John 8:12), the two natures of Christ, divine (burning wick) and human (wax pillar), and our prayers. Who is behind the iconostasis? Why do they face away from the people? Our clergy lead us in prayer from behind the iconostasis, assisted by servers. In front of them are the altar table symbolizing at once God's throne, the Divine Banquet table, and the altar of Christ's sacrifice for our sins. Only clergy and authorized laymen are permitted behind the iconostasis. The priest stands with his back to the people because he is leading us in prayer and worship before God. When he turns to face us, either to read from the Gospels or to bless the people, he represents God blessing the Church. Why do the clergy and altar servers wear such unusual clothing? These distinctive garments are called vestments. Rooted in Old Testament worship (see Exodus 28-29), each item manifests God's grace given to those who hold priestly office or serve at the altar to perform their duties. Why do we stand throughout the Liturgy? To stand was the pattern of prayer for the Old Testament Church just as it is the pattern of prayer for the Heavenly Church (see Isaiah 6:2, 1 Kings 22:19, Daniel 7:10, Matthew 5:6, Revelations 7:11). As with kissing icons or making the Sign of the Cross, standing in prayer demonstrates our faith. In this case, we also demonstrate our dignity as Children of God in Christ as well as our common effort. We only sit during the homily (sermon). Why does the choir sing a capella? The teaching of the Church Fathers explains the use of musical instruments in Old Testament worship as a concession to the Israelite's inability to give up that aspect of ancient culture. New Testament worship, on the other hand, has always emphasized sober and spiritual worship. Musical instruments were not used in early Christian worship because they were associated with the loud, chaotic, and immoral pagan rites and parties of the ancient world that Christians were encouraged to leave behind. So the Church continues to employ purely vocal music. What is that smoking metal vessel? Why does the priest swing it at times during the service? The vessel is a censer in which fragrant incense is burned during Orthodox services. The twelve bells attached to the chain represent the teaching of the Twelve Apostles. The priest swings the censer during the service -- sometimes toward the icons, sometimes toward the people -- to direct smoke heavenward with the prayers of the Church. Why is the phrase "Lord, have mercy" repeated so often? The Orthodox Liturgy is responsive prayer, with the priest leading and the choir and people echoing agreement. So phrases like "Lord, have mercy," "Grant it, O Lord," and "Amen" respond to the different specific petitions offered by clergy on behalf of the community and the world. When "Lord, have mercy" is repeated three times following each petition, it emphasizes the urgency with which we pray -- "Lord, pleasehave mercy." Why is Mary called "Ever-Virgin?" What does "Theotokos" mean? Mary is called Ever-Virgin because the Orthodox Church continues to teach that she remained a virgin following Jesus' birth. When the Bible speaks of Jesus' brothers, the cultural context allows for cousins and distant relatives to be referred to as brothers. Moreover, "Ever-Virgin" refers to the ongoing purity of she who consented to be the vessel through which God became Man. "Theotokos," a Greek term that means "Birth-giver of God," was given to the Mary by the Third Ecumenical (All-Church) Council in A.D. 431, which refuted a heretic who denied Jesus' divinity. So the title "Theotokos" is applied to Mary only in reference to Christ. What do these words mean: "antiphon," "troparion," "kontakion," and "prokeimenon?" These are all hymns. An antiphon is a collection of Scripture verses, usually from the Psalms. A troparion is a brief hymn expressing the main focus of that day's celebration. A kontakion is similar to a troparion, except that it expresses the history of the celebration. Each day of the Orthodox calendar has at least on troparion and kontakion. A prokeimenon is a passage of Scripture that introduces the theme of the Epistle reading to follow. These are the Eastern Christian counterparts to the psalms (antiphons), hymns (troparia), collect-hymns (kontakia), and graduals (prokeimena) still found in some Western Christian liturgies. Why do the clergy and servers proceed among the people at times during the service? What are they carrying? Those circular processions of clergy and servers are called "entrances." During the Small Entrance, which follows the antiphons, the priest elevates the Gospel book, symbolizing our approach in Christ to the throne of God and our preparation to hear His Word. During the Great Entrance, which follows the Gospel reading and homily, the priest elevates the chalice and paten, symbolizing our offering of our whole selves to God as Christ offered himself for us. In the chalice, a large, long-stemmed gold or silver cup, are the wine and water that will become the Blood of Christ used to celebrate the Eucharist. On the paten, a small gold or silver plate, are the Lamb -- the bread that will become the Body of Christ used to celebrate the Eucharist -- and other smaller pieces of bread commemorating saints. Why does the priest frequently proclaim, "Wisdom..."? "Wisdom..." is a call to pay attention to the important things that follow. Why are the readings chanted? This practice continues from the Old Testament synagogue tradition. Chanting offers a number of advantages over simple reading. It aids in the memorization of passages to be recited, projects the voice farther than does normal reading aloud, permits the reader to emphasize certain words to enhance meaning, and brings an enhanced aesthetic character beyond that of simply the spoken word. Why does the priest say, "The doors, the doors?" In the early Church, non-Christians and catechumens were excused at this point and the church doors were closed. Only baptized Christians were permitted to participate in "the Liturgy of the Faithful" that followed. This call commemorates that era when being a Christian was a capital offense, and it continues to express the seriousness of the commitment required of the faithful. Do you really believe that Bread and Wine become the Body and Blood of Christ? The Eucharist is the high point of the Divine Liturgy. During the Liturgy, the faithful call on the Holy Spirit to consecrate the bread and wine, making them by grace the Body and Blood of Christ. Some other Christian traditions have tried to explain this. Orthodox Christians are content to accept this Sacrament as a mystery by faith. Is it healthy to use a common cup and spoon during the Eucharist? Because the alcohol in the wine acts as an effective antiseptic, there have been no reported cases of contagious diseases contracted through the participation in Communion. Why do people cross their arms when lined up to receive the Eucharist? This posture symbolizes the respect and awe with which we humbly approach the Body and Blood of our Savior. May I receive the Eucharist? If you are an Orthodox Christian in good standing with your home parish and are prepared to receive the Eucharist, we invite you to join us. Otherwise, we invite you to receive the antidoron bread at the conclusion of the service. What is the significance of the basket of bread? The basket holds altar bread not used for the Eucharist. In the early church, it was distributed to those who could not take the Eucharist, hence the name antidoron -- "instead of the gift" -- bread. Today, it is offered to all. Following the Liturgy, why does the priest sprinkle water on the heads of some people? It is our custom for the priest to lead us in prayer for those who will be travelling during the coming week and to bless them with holy water. What is meant by the song "Many Years?" We sing "Many Years" to those who will have birthdays, anniversaries, and name days (commemorating the saints for whom they were named) during the coming week. Why does your Crucifix have three bars? The distinctive three-barred cross is part of the Russian heritage of the Orthodox Church in America. It is not Russian in origin, though; it comes from the early Church. The short top cross represents the sign nailed to the Cross of Christ proclaiming in Latin, Greek, and Hebrew: "Jesus of Nazareth, the King of the Jews." The longer middle cross represents the familiar crossbeam to which Jesus' hands were nailed. The short slanted cross at the bottom represents the footrest to which Jesus' feet were nailed. Fr. John Matusiak, Director of Communications in the OCA, writes: "Various reasons have been given for slanting the bottom bar. There is one tradition which states that, at the moment of His death, Our Lord's foot slipped and the footrest tilted. A highly symbolic interpretation states that the slanted bar refers to the thief crucified on Our Lord's right side -- the "Wise Thief" who repented -- who went to heaven and to the unrepentant thief crucified on Christ's left side who did not. Another explanation is that the slant is an attempt to depict that the footrest slanted downward, toward the viewer, albeit in a two, rather than three, dimensional form." How do I become an Orthodox Christian? The first step would be to make your interest known to our priest. He will discuss your religious background and spiritual needs with you. At a mutually agreeable point, you will become a "catechumen," a Greek word that means "those who learn the faith," and pursue the best course of study to become familiar with Orthodox doctrine and practice. When completely prepared, you will be received into the Church, by baptism or chrismation, whichever is appropriate. If you have any other questions not addressed here, please feel free to ask our priest or any other member of our community. In order to prepare for Holy Week Services there will be a work session to decorate the tomb and set up the hall at 10 am on Friday, April 26TH.